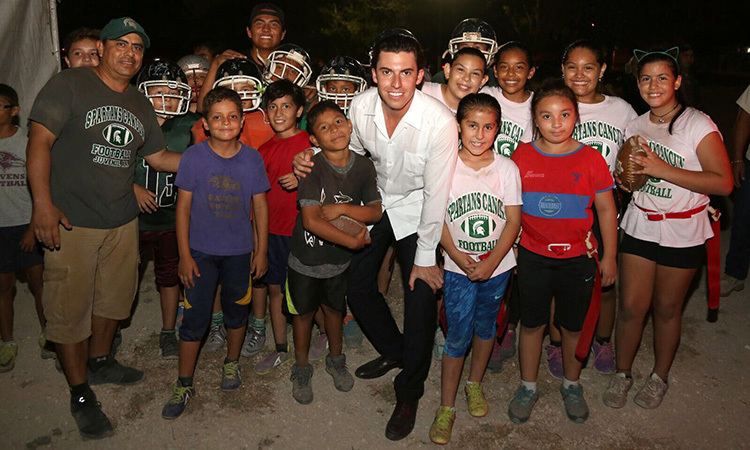 Remberto Estrada Barba said that the 2016-2018 administration will continue actions and programs to improve the quality of life of Cancun families. CANCUN — “Today I come to endorse the commitment of the current administration to work for the benefit of all Benito Juarez (municipality to which the city of Cancun belongs), consolidating more social works, infrastructure and programs that the population requires, to improve their quality of life so that together we can achieve a better Benito Juárez”, affirmed the Mayor, Remberto Estrada Barba. Gathered in the sports dome of Supermanzana 60 (one of the colonies of the city), the Mayor announced the rehabilitation of the soccer field, by the inclusion of a perimeter fence, lighting, painting and outdoor gym, to leave it in the best conditions, especially for the children and youth that can enjoy and develop their physical activities. He remarked that such infrastructure will not only benefit the inhabitants of Supermanzana 60, also the surrounding colonies, together with the services of integral assistance brigades. Estrada Barba recalled that as a result of the negotiations with the Federal Congress and Government, resources were obtained to develop more and better public works and quality infrastructure in the municipality, as well as implement programs such as these brigades that improve the quality of life of families. He noted that the their social programs have the objective to make it easier for the population to have access to different types of services, reaching the attention of the different municipal agencies for the colonies and regions, to avoid that citizens had to travel to their offices, to get access to services and administrative procedures, which represents an economic and time saving for citizens. Cancun Mayor said that these permanent works, which will reach all the most vulnerable areas of the municipality, prove their commitment with the society “to provide coverage in social care to all inhabitants of Benito Juarez, Because we want them to improve their quality of life, have better services and work together in the consolidation of a better Benito Juárez “. Meanwhile, the Municipal Secretary of Social and Economic Development, Francisco Carrillo Flores, said that this time were offered discounts on the payment of property tax; as well as free pet vaccinations, environmental education activities, plant donation, legal advice and social management, haircut, medical assistance, civil registry; as well as with the participation of the Food Bank, the blood donation program, drugstore on wheels, among others.